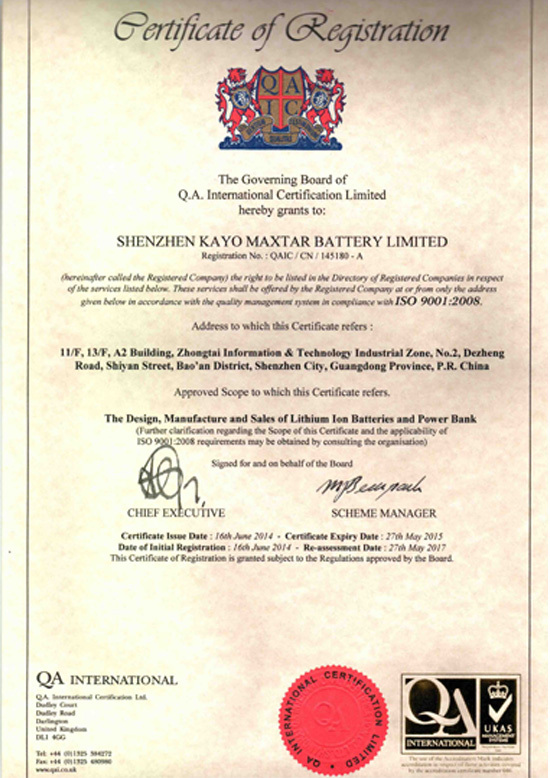 KAYO MAXTAR company group is one of the large-scale battery manufactures in China. It was co-established with deep cooperation in technology and management from china and KAYO Battery Company from Japan in 1999. Till now, KAYO company group own 4 manufacturing companies distributed in Shenzhen and Yuanjiang, Hunan, with a total area of more than 10,000 m2 , and total staff of more than 2,000.As a technology leader in battery manufacturing, KAYO masters the international advanced li-polymer battery manufacture technology and possesses national advanced fully automated production equipment. Since established, KAYO took advantage of mature management experience from Japan in Research, Development, Quality Control, and Sale. Our products comply with the UL, CE, FCC, PSE, KC certification and all our products comply with the eu ROHS testing requirements. The company group has more than 100 skilled and experienced talents, more than 60% of which are with graduate degrees. The enterprise has been authorized dozens of battery invention and utilization patent.As the core manufacturing unit of the KAYO MAXTAR company group based in Shenzhen , KAYO MAXTAR BATTERY LIMITED focus on the R&D of high-level Lithium battery and polymer Lithium battery, the Research covers many fields including materials chemistry, electrochemistry, battery active & passive management system, AC & DC energy storage control system, structure technology and packing technology.KAYO MAXTAR BATTERY LIMITED positioned a globally oriented market. Through the tireless efforts of all our colleagues, KAYO MAXTAR products sold very well in more than 30 countries and regions in the world, including Japan, South Korea, and the European countries. Our major foreign clients include: Honeywell, Panasonic, Toshiba, NTT, Mitsubishi, Samsung and other famous enterprises. Relying on it's high quality products and sincere service, KAYO MAXTAR is widely accepted by customers in various fields including communication, IT, household appliance, finance, security, etc.